A simple guide to understanding airbrush terminology, types of airbrushes, and their recommended uses, This guide is offered to help airbrush users select the best airbrush for their application, and to provide important usage/maintenance information. Comprised and provided compliments of BADGER AIR-BRUSH CO.
turning/setting a needle (color) adjustment screw. When the trigger is depressed, a pre-set amount of material is sprayed. the trigger for material flow adjustment). This style airbrush allows the user to adjust line width while spraying. detail airbrush applications and truer realism effects. EXTERNAL MIX indicates that air and paint mix outside the airbrush, producing a coarse round spray pattern. INTERNAL MIX indicates air and paint mix inside the airbrush, producing a precisely atomized “fine dot” spray pattern. Airbrushes spray a series of dots (atomized material). An external mix airbrush sprays a larger coarser dot pattern, which is preferable for larger surface coverage and volume spray applications. An internal mix airbrush sprays finer “softer” dots, and is preferred for precision finishing needs, such as color gradations, shading effects, and fine lines. BOTTOM FEED refers to airbrushes on which material enters through a siphon tube or color cup attached to the bottom of the airbrush. This type of airbrush should have at least 18 PSI while spraying to operate properly. GRAVITY FEED refers to airbrushes on which material enters at the top of the airbrush through a top-mounted color reservoir. Gravity draws the material into the airbrush. This type of airbrush can be operated at spray pressures as low as 8 PSI. SIDE FEED refers to airbrushes on which material enters at the side of the airbrush through a side attached color reservoir. This type of airbrush operates best at approximately 12 PSI. DUAL FEED refers to an airbrush that has the ability to be used as either gravity feed or bottom feed depending on the user’s varying application needs. 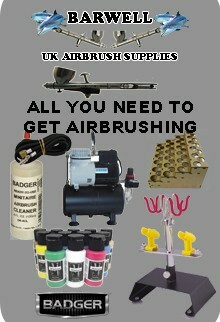 This type of airbrush is patented and exclusive to Badger Air-Brush Co. The Bottom Feed airbrush is best for general and production applications. The bottom feed airbrush facilitates the use of more material without having to frequently fill the material reservoir. The bottom feed airbrush also allows (or causes) the artist to work at a brisker pace, enabling faster spray application when desired. Nozzle sizes -There are varying airbrush nozzle sizes for spraying a range of materials. Although they have some effect on the line an airbrush produces, nozzle sizes (Fine, Medium, Heavy or 1, 3, and 5) apply more to the material that should be sprayed through the airbrush than the fineness of line an airbrush will produce. The line fineness is ultimately determined by multiple factors – nozzle size, the needle’s linear air flow angle, pigment/base ratio of paint, pigment size, operating pressure, etc. NOTE: You need to have the right nozzle/needle size with the right spray medium for optimum airbrush performance. Fine/1: Best suited to spray thin, low viscosity mediums (inks, water colors, dyes, stains and gouache). Medium/3: The most popular choice; will spray airbrush ready paints, properly thinned acrylics, lacquers, enamels, urethanes, and special application materials (food airbrushing colors, tanning solutions, airbrush cosmetics, body paints, etc.). The key factors in properly spraying an airbrush are operating air pressure, amount of material being released by the airbrush, and the distance the airbrush is being held from the surface being sprayed. For fine lines the airbrush should be held as close as possible to the surface with a small amount of material being released, for broader spray coverage the airbrush should be held 4” to 6” from the surface being sprayed with a larger volume of material being released. NOTE: The airbrush will produce overspray. This is the “fuzz” of dots that sprays outside of or around the spray’s desired focal point. If a sharp edge is desired, a masking medium (stencil, frisket, low-tac masking tape, spray shield, etc.) must be utilized when airbrushing. There are some simple learning exercises that can be practiced to help develop skill, comfort, and confidence in using the airbrush: creating a grid of dots (on a blank sheet) with your airbrush – then going back and connecting the dots,drawing figure eights, and/or simply writing your name with the airbrush. These are all basic, but effective, airbrushing exercises. To practice airbrush technique on three dimensional objects, paint items such as scratch plastic/metal, pop cans, shampoo bottles, or other contoured items that are of little or no value. THE ONLY THING THAT CANNOT BE TAUGHT RELATED TO USING AN AIRBRUSH IS PRACTICE. minutes, and anything you think will take 2 minutes will usually take at least 20 – so spray the cleaner. Step two: Should material set up (dry) in the airbrush, it may be necessary to back flush the airbrush. This is done by suffocating the air flow of the airbrush at the nozzle (while spraying cleaner) by carefully “pinching” a soft cloth over the nozzle’s end. This deflects air back into the airbrush chamber -loosening dried material and sending it into the cleaning bottle/color cup. If done correctly, the cleaner will bubble during back flushing. After back flushing, dump/remove back flushed material from the airbrush – don’t spray it out of airbrush. Spray fresh cleaner through the airbrush after you have back flushed it. Step three: On what should be rare occasions it may be necessary to disassemble some parts of the airbrush for more thorough cleaning. This should only be necessary if the previous cleaning steps are not done regularly or are unsuccessful in cleaning the airbrush. If disassembly is required, it should only be of parts that come in contact with the sprayed material; from the material’s point of entry into the airbrush and forward. This includes are the nozzle assembly and the needle. To thoroughly clean the nozzle assembly, use an ultrasonic cleaner or denture cleaner (yes, denture cleaner – follow the directions on the package). The needle should be wiped down with a soft cloth saturated with the appropriate cleaning agent. If residue on the needle is still apparent it may be removed by gently rubbing a fine steel wool over the residual deposit area. While the needle and nozzle are removed from the airbrush it is OK to run a pipe cleaner saturated with cleaning agent through the chamber of the airbrush, following the same path as sprayed material, and out the airbrush front. For bottom feed airbrushes that is up the jar adaptor stem and out the front, for gravity feed airbrushes it is down the color cup and out the front. Only do this when the needle and nozzle are removed -forcing anything through the nozzle will damage it. A cleaner saturated cotton swab can also be used to clean the airbrush’s jar stem and the airbrush’s paint tip housing. Be careful not to scratch or damage any seal requiring surfaces. After using the pipe cleaner/cotton swab, blow out the airbrush to remove any “fuzz”. After all nozzle/needle cleaning steps are complete the airbrush can be reassembled and will be ready for use. This disassembly process should be rarely necessary if steps one and two are followed, but it is recommended if storing your airbrush for an extended period of time. COMPRESSORS -A unit that generates at least 30 PSI is recommended to start airbrushing. Some applications, such as T-shirt painting or other fabric painting, may be more efficiently done at higher pressures (up to 65 psi). Other applications, such as finger nail art and illustration may be more effectively done at lower pressures (as low as 10 psi). For applications requiring higher and lower pressure it is recommended to use a regulator (described below). CO2 (or other inert pressurized gas) -A pressurized tank of inert gas can be used to operate an airbrush. A CO2 regulator is required to connect the air hose and moderate the air pressure. AIR TANK -A compressor filled air tank (or spare tire of a car) can be used for short term project oriented airbrush applications. PROPEL -A can of “air” that enables spraying for 5 to 15 minutes (dependent on can size) can also be used to operate an airbrush. This is best for beginners and those not certain they will continue airbrushing after trying it. After 5 cans start looking at compressors. BRAIDED air hoses are the most common and most durable type of airbrush hose. A braided air hose can handle over 100 psi (more thanenough for airbrushing). Braided air hoses are available with in-line moisture traps and quick disconnects. CLEAR air hoses are best for airbrushing in environments where in-line moisture or contaminates may be a concern, because the user cansee any material passing through the hose before it reaches the airbrush. A clear air hose can handle up to 50 psi and airbrush applications performed up to that pressure. Clear air hoses are available with moisture traps. RECOIL air hoses are best for small work area airbrushing, because they stay out of the way. Recoil air hoses handle up to 50 psi and can be used in airbrush applications performed up to that pressure. VINYL air hoses handle up to 40 psi and are primarily for use with propel. Vinyl air hoses are not recommended for compressors. AIR REGULATORS WITH A GAUGE allow the airbrush user to set air pressure to exact psi levels with a dial setting. AIR REGULATORS WITHOUT A GAUGE allow the airbrush user to adjust air pressure based on a “trial and error” setting process. MOISTURE TRAPS capture moisture produced by a compressor when air cools. They are desirable in high humidity areas to prevent moisture from flowing through the air hose and out the airbrush on to a work surface. AIR REGULATORS WITH A GAUGE AND MOISTURE TRAP combine the two items described above. A stencil cutting knife is used to cut custom stencil designs in stencil film (described below) and acetate. Airbrush needle lubricant helps prevent paint from drying on the nozzle/needle tip, reducing related airbrush clogging. An airbrush holder provides a much needed a place to set your airbrush when you’re not using it. That need is usually realized when your holding your paint filled airbrush looking for a place to set it down. FastBlast jar adaptors connect the jar to a bottom feed airbrush. The FastBlast one piece siphon tube design is much easier to clean and is available in a variety of jar mouth sizes. Many professional artists put an adaptor on each color they’re using. Siphon filters slide over the jar adaptor siphon tube, preventing un-sprayable particles from entering and clogging the airbrush. STENCILS are pre-cut design masks used to aid in the creation of an image. Stencils make airbrushing easier for beginners, and are anexcellent tool for producing recurring designs time and cost effectively. Stencils are available with and without adhesive backing. FRISKET FILM is a low tack adhesive backed film used to cut and mask designs or cover a specific area of an image to prevent sprayed material from going on to it. Frisket film is available in gloss or matte finish. The matte finish enables the artist to draw on the frisket film. There is also “liquid” frisket for easier masking off of contoured shapes. STENCIL FILM, an uncut (usually non-adhesive backed mylar) film used to create custom masking designs for airbrushing. Paints -The rule of thumb for preparing paints (or other materials) for airbrushing is to reduce them to the approximate visual viscosity of 2% milk. As starting paint viscosities often vary from color to color, even within a specific paint brand, it is best to avoid fixed thinning ratios. It is also best to vigorously mix/stir paint rather than shaking it before use because mixing/stirring paint better blends pigment and base creating a more consistent paint from the top to the bottom of the bottle, and causes pigment to re-settle slower. Various paint types and materials, including acrylics, lacquers, enamels, urethanes, inks, water colors, dyes, stains, cosmetics, and food colors can be applied with an airbrush if properly reduced for spraying. Airbrushing can be done on canvas, paper, textiles, plastics, metals, wood, etc. Even the human body (skin/nails) can be airbrushed. .Color mixing kits, which consist of a small cup and stir sticks, can be used to mix colors, creating new colors. Learning Aids -Books/DVDs on general usage and/or specific technique provide excellent instruction for the aspiring airbrush artist. A. Damaged nozzle seal / Make certain the paint tip is properly seated in the angled recess of the airbrush body, and that all surfaces between the two components are cleared of any debris and are not marred or scratched. B. Tip dry / Remove the dried paint from the paint tip by picking it off with your finger nails or spraying cleaner through the airbrush. If tip dry occurs frequently in your application, it is helpful to keep a paint brush and small container of water nearby to wet the paint tip when necessary to get your airbrush spraying properly again. Tip dry will occur more frequently during detail airbrushing applications, and when spraying at higher air pressures. C. Incorrect spray regulator alignment / Tighten or loosen your spray regulator in ¼ turn or lesser increments to determine if that is the cause of the problem. If it is, your airbrush will stop bubbling and spray properly once you hit the spray regulator’s “sweet spot”. D. Split paint tip / Replace the paint tip. A. Bent needle tip / Carefully attempt to straighten the needle tip. A grooved sharpening stone is an effective device for straightening bent airbrush needle tips. If you are unable to straighten the needle tip, a replacement needle will need to be installed to correct the off-center spray concern. A. Swollen or damaged air valve o-ring / If air valve or-ring is swollen due to soaking airbrush allow it to dry out. It may return to its correct size. If o-ring does not return to its correct size or is damaged and not functioning properly, it needs to be replaced. A. Damaged or worn PTFE inner seal / Tighten inner seal adjustment to restore seal around airbrush needle and stop seepage of media/color to the rear of the airbrush. If seal is not adjustable, it needs to be replaced. A. Improper seating of the needle in the paint tip / Re-seat the needle by loosening the needle locking nut and sliding the needle forward until it stops and seats in the nozzle tip, then re-tighten the needle locking nut. DO NOT USE FORCE when seating the needle in the nozzle tip, when it stops it should be seated properly. B. “Flared” paint tip / It is necessary to replace the nozzle tip. C. Partial tip dry / Remove the dried paint from the needle/nozzle tip by picking it off with your finger nails or spraying cleaner through the airbrush. If tip dry occurs frequently in your application, it may be helpful to keep a paint brush and small container of water nearby to wet the nozzle and get your airbrush spraying properly again when necessary. Tip dry will occur more frequently in detail airbrushing applications. A. Damaged seal / Low levels of air leakage are common, and should not adversely affect an airbrush’s spray performance. Check all threaded parts and seals to ensure there is no excessive air leakage at any of these points. The air hose connection at the airbrush should be properly sealed. If there is air leakage at this connection, it can be effectively sealed with the wrapping of PTFE “plumber’s” tape around the male threaded part. The airbrush also has an inner seal that the needle passes through. If the airbrush’s inner seal is not sealing properly, it needs to be replaced. This replacement is done inserting a small flat-head screw driver into the back side of the airbrush body and removing the old seal by turning it counter clock-wise until it comes out, then inserting the new seal into the back of the airbrush body and turning it clock-wise to secure it into place. B. Inconsistent media viscosity / paint should be adjusted to proper spraying viscosity. The rule of thumb for preparing media for airbrushing is to thin to the equivalent viscosity of skim milk. As starting paint viscosities vary from color to color, even within the same paint brand, it is best to avoid fixed thinning ratios. C. Inadequate air supply / it may be necessary to repair or replace the air supply. A. Parts not securely tightened / On finger tight assembly nozzles, firmly grip connecting parts in fingers and tighten. Some nozzles/components may require a wrench/pliers to tighten. It is advisable to pad the wrench/pliers to avoid marring or stripping the components. B. Threads not sealed / some airbrushes, designed with easier maintenance finger tight assembly nozzles, will have slight air leakage at nozzle connections. This slight air leakage is expected and incorporated into the nozzle’s design. Air leakage is a concern if the airbrush does not atomize properly. In instances where the airbrush does not atomize properly -if the air leakage is at the nozzle, it is recommended to seal the nozzle threads with bee’s wax or chapstick. If the air leakage is at the hose/valve casing connection, it is recommended to wrap the male threads of the connection with PTFE “plumber’s tape”. A. Media not properly thinned / Media should be the viscosity equivalent of skim milk to spray properly. Add the appropriate thinning agent to reduce the media to a spray-able viscosity. A. Nozzle flooded with media / “flooding” the nozzle occurs when the airbrush is not triggered properly. It is important to learn and use correct airbrush triggering technique -make sure to always return the trigger to the forward (color off) position before releasing the trigger to turn off air. A. Paint is too thin / remix paint or start with fresh paint that is proper viscosity for spraying. B. Too much media released while spraying close to the surface / take care to not slide trigger back too far, releasing too much media, when working close to the surface. C. Media applied too heavily / apply media in lighter/softer coats – allowing one coat to dry before applying another. A. Improper triggering technique / be sure to begin hand movement before sliding trigger back to release color, and do not stop your hand movement before returning trigger to the forward position to turn off color flow. This can only be corrected through practice of proper triggering techniques. B. Turning wrist at end spray stroke or arcing closer to the surface during the spray stroke / learn proper triggering technique and practice, practice, practice!